My name is Laura Gillhespy and I am a fortunate winner of the British Council and CRCC Asia Disability Program 2015 – www.crccasia.com/disability-scholarship. 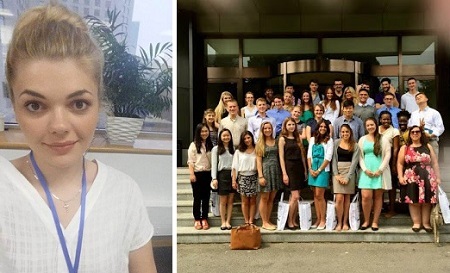 I have just completed my first week at the British Council office in Beijing, China. As I am disabled with a bilateral hearing impairment this internship and work experience is really suited to me because the British Council works to include disability and has a Diversity and Equal Opportunity Policy that is reviewed regularly. This informs their approach to diversity as an important aspect of their cultural relations work. I have consequently found it incredibly easy to be honest and open about my disability, following information and advice from OPEN-to-you events in London and I have settled into my role incredibly quickly. Having just completed my law degree at the University of York, I am undertaking a project with the Human Resources department; primarily consisting of analysing policy documents in relation to employment law and the differentiation of applying it both to British Council’s Chinese and British employees. This work is engaging and although I have not studied employment law previously, I am learning an incredible amount about the cultural differences between the UK and China through this analysis of the discrepancies between both forms of legislation, as well as about employment law more generally. I have previously completed an internship with Selby District Council, so the main concern for me was not actually the internship itself. The main concern was the language barrier, made especially difficult with my disability. This is because understanding Chinese seemed near impossible for me as I have never been able to learn another language apart from British Sign Language. I find it extremely hard to hear words as well as the pronunciation and having not studied any Mandarin previously as most of the American interns here have, I found the prospect of learning another language quite intimidating. However, this barrier is not actually going to present me with as much difficulty as I thought. Whilst at school I dreaded the tape recordings and oral assessments learning Spanish, French and Latin, here the British Council provide me with Chinese lessons twice weekly as well as the group classes with the other interns. These differ from learning foreign languages at school because these lessons are one-on-one, so my teacher really pays attention to my abilities and repeats everything as many times as needed, as well as spelling out the sounds on paper, which is vital for me to grasp an understanding. Although it may take me slightly longer than most, in my first lesson I feel accomplished having learnt how to ask for a bottle of water. (Wo xiang yao yi píng shui). A possible problem may be when people wear pollution masks over their mouths and nose to block out the high pollution levels in China. I have found that I cannot lip read and the sound gets blocked so I struggle a lot to communicate, even with my hearing aids. Luckily there have not been any warnings for the pollution levels yet so this has not been a major problem for me so far, but when people do wear them, I have just managed to be honest with the other interns that I am communicating with. The response is overwhelmingly positive and I have not felt embarrassed or hesitant to ask someone to kindly remove their mask whilst talking. 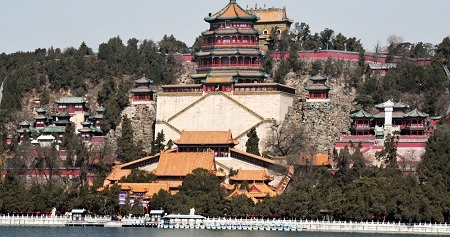 I have made friends from across the globe and I feel included with all the activities and events that go on every single day, including a trip to the Summer Palace (below). The cultural language barrier and different nationalities actually appear to work in my favour as everyone has varying accents so nobody minds repeating themselves multiple times. This increased confidence to travel and engage with people internationally has been furthered with a bus ride home last week, where I made friends with 6 year old Michelle and her mother. Michelle offered me a plastic bag to sit on as the seat was wet from a thunder storm. She was learning English at school so her mother encouraged her to ask me some questions that she had been learning. The prospect of communicating with anyone on a loud and noisy bus back home would have been extremely daunting for me, but with patience and repetition, we were able to exchange pleasantries and email addresses. In the future, I aspire to work for an international law firm with the hope of completing a secondment in Asia or America if I am successful in obtaining a training contract. I have been enriched from this experience so much already and I cannot wait to experience the Great Wall of China as well as China’s other wonders, including traveling to Shanghai and climbing mount Moganshan later in the in summer. I am confident that my disability will not hold me back in becoming a qualified solicitor. My disability is my advantage – surely not? Would you speak to your Gran like that?